This is an updated version of a previous post from March 2016. Below is a list of all the railways that Sydney might expect in the near future. It only includes heavy rail (i.e. Sydney Trains or Sydney Metro, but not light rail) and includes both new lines or extensions to existing lines. Railways must have been proposed by the state or federal government, so any railways proposed only by local councils or lobby groups are not included nor any railways mentioned exclusively in internal government documents not intended for public release. Also excluded are railways previously announced but since cancelled. The current incarnation of this line was announced in 2010, with construction commencing in 2014. It is scheduled to open in 2019. This line consists of 23km of new track between Epping and Cudgegong Rd near Rouse Hill as well as the conversion of the existing 13km Epping to Chatswood Line (opened in 2009) to metro operation. A line with a similar alignment was originally announced in 1998 (connecting to the Northern Line at Eastwood rather than Epping), but cancelled in 2008 in favour of a metro line that was itself also cancelled. It has previously been known as the North West Rail Link and Sydney Rapid Transit. This line was announced in 2014, with construction commencing in 2017. It is scheduled to open in 2024. This line consists of 13km of new track between Chatswood and Sydenham as well as the conversion of the existing 17km Bankstown Line between Sydenham and Bankstown to metro operation. This line was announced in 2016, with no date currently set for construction to commence. It is scheduled to open in the second half of the 2020s, though the government is understood to be keen to fast track a 2026 opening date. Stations have been confirmed for Parramatta, Sydney Olympic Park, the bays precinct, and the Sydney CBD. Four options are currently being considered, with a Metro Rapid option firming as the favourite providing the highest benefit-cost ratio. This option involves a 20 minute journey between Parramatta and the Sydney CBD, with trains travelling between 10 stations at up to 130km/hour, with a benefit-cost ratio of 2.5. UPDATE: However, the favoured option appears to be the Metro Local South. This option involves a 25 minute journey between Parramatta and the Sydney CBD, with trains travelling between 12 stations at up to 100km/hour, with a benefit-cost ratio of 2.3 when the sale of air rights to development above stations is taken into account. Technically not yet announced, the government is understood to be about to announce an extension of the existing T2 Line from Leppington to the T1 Line at St Marys via a new Western Sydney Airport at Badgerys Creek. Previous investigations into an extension of the South West Rail Link from Leppington also included a Southern extension to Narellan. This extension provides the greatest potential for a freight rail connection to the new airport, whereas a metro connection would be unlikely to provide the opportunity for freight trains to reach the new airport. NSW Premier Gladys Berejiklian has indicated her preference is for a rail connection after the airport opens and further commented that “Some major airports around the world take up to 10 years to build a rail line”. With a 2026 scheduled opening date for a Western Sydney Airport, this would suggest a 2026-36 opening date for an airport railway. Meanwhile, Federal Opposition Leader Bill Shorten announced his support in April 2017 for a North-South rail connection, but went further in calling for it to be completed in time for the opening of a Western Sydney Airport in 2026. So although there is a difference in opinion on timing, there is now bipartisanship support for a rail line connecting the airport to Leppington and St Marys. Work on preserving a corridor to extend the Sydney Metro Northwest began before construction on the line had even begun. Two options were considered: a Northern extension to Riverstone and a Western extension to Marsden Park via Schofields. The latter option was chosen with the potential to extend it further to the Mount Druitt area, although the corridor is to be reserved with mode neutrality. In other words, it could be both as an extension of Sydney Metro, but it could also be built as even bus rapid transit/light rail or even heavy rail with double deck trains from the T1 Western Line at Mount Druitt or St Marys. This proposal would see the Sydney Metro extended from the currently planned terminus at Bankstown out to Liverpool. Such a line could link both Bankstown and Liverpool to Bankstown Airport, allowing for potential redevelopment of the current airport site. That would be in line with the Government´s pattern of building new transport infrastructure in places that enable new developments, including Waterloo, Sydney Olympic Park, the Bays Precinct, or the proposed redevelopment of Long Bay Prison. It would also provide connections between Liverpool and the Sydney CBD via Bankstown that are set to be lost once the Bankstown Line is converted to Metro services by 2024. Prime Minister Malcolm Turnbull has called for a rail link to the airport to be built by the year 2046, but not necessarily ready to open simultaneously with a Western Sydney Airport. However, this was before the NSW Government opted for a North-South rail link from Leppington to St Marys, which is set to be announced jointly with the federal government. An Eastern extension of the Sydney Metro West, this line would link up the Sydney CBD to the South East along a former tram reservation on Anzac Parade. To this date, there is no official government proposal for this line, only an unsolicited proposal from 2016. However, Infrastructure NSW has been investigating the Anzac Parade corridor since 2014. The plans would involve the sale of the Long Bay Prison for redevelopment, which itself would help to fund the construction costs of a rail line down that corridor. This is in line with similar plans for Waterloo, the Bays Precinct and Sydney Olympic Park where new metro lines would support redevelopment that would in turn be enabled by the new metro line. So far, this corridor has been investigated for an entension of the currently under construction light rail line out to Kingsford. Despite this, the close correlation between the unsolicited proposal and line actually being planned at the moment are close enough that an extension to La Perouse via Long Bay appears like a good proxy for official government policy. The NSW Government’s decision to build the Sydney Metro via Waterloo rather than Sydney University was based on the radical densification of the area surrounding a new Waterloo station. The precinct, currently made up of about 2,000 dwellings for public housing, is set to be re-developed with 7,000 dwellings. For a site that is 19 hectares in size, this represents 368 dwellings per hectare or about 700 residents per hectare. The response has been mostly negative, with criticism emanating from the City of Sydney Council as well as the state opposition, raising concerns that the development is too dense. Comparisons have been made to Green Square, an urban renewal site about 1km South of Waterloo, where an additional 53,000 residents are expected to occupy an area equal to 278 hectares. This represents 190 residents per hectare, much lower than the 700 planned for Waterloo. To find a comparable city with population densities that high requires comparisons with Hong Kong. But that is not a fair comparison. It compares a dense town centre (the Waterloo precinct), where densities are high but are surrounded by lower density residential areas, with entire suburbs (Green Square) or even metropolitan regions (Hong Kong). A much better comparison would be with the 5.8 hectare Central Park which contains 2,200 residential apartments and 900 units of student accommodation. All together that is 3,100 dwellings which equates to 534 dwellings per hectare, compared to a proposed 368 dwellings per hectare in Waterloo. If Central Park can handle a higher density well, then surely Waterloo can too. This is an important distinction as Central Park has been hailed as a great success story, one of density done right and in a manner that the community supports. Ironically, some of the same individuals and groups who have supported Central Park and are concerned about reducing Sydney’s housing shortage have also come out to oppose this, a similar project that would achieve that very goal. The key is density done right. It’s not just a matter of plonking a row of high rise towers on top of a metro station near the CBD and assume they will automatically be a success story. It has to be well planned and well integrated into the existing urban fabric. That is the debate that should be occurring right now – how to best build the 7,000 new apartments in a way that minimises the impact on existing residents and ensures that they are supported by the necessary infrastructure. Flat out opposing it or scamongering to appease the NIMBY voters is not helping. 12 months ago the NSW Government had already committed to the creation of a light rail network around Parramatta and an extension of the Sydney Metro from Chatswood to Sydenham. But the question remained: which alignments will it choose? At the time, the favourites were a light rail line to Macquarie Park and a metro line via Sydney University. However, since then the Government opted for a metro line via Waterloo and light rail to Sydney Olympic Park over the previously mentioned alignments. Among the reasons given were the capacity for value capture and the potential for development of new homes. The first reason given of value capture, involving the contribution to construction costs of new infrastructure by those who benefit from that new infrastructure when their property values rises, is not a new one; but has been gaining in momentum by bureaucrats and politicians at both the State and Federal levels including Prime Minister Malcolm Turnbull. The primary advantage is the ability for new infrastructure to pay for itself, freeing new projects from the constraints of government budgets. The primary limitation is that it tends to be overstated, with Alan Davies arguing that its benefits are modest. The second reason given of potential for new development has arisen due to concerns over housing affordability. Government could address this by either curbing demand (such as reigning in negative gearing/reducing capital gains tax concessions) or increasing supply (often by removing constraints on development due to insufficient infrastructure). The former policies on demand are almost exclusively in the domain of the Federal Government, while the latter on supply are almost exclusively in the domain of the State Governments. These pressures have shifted Government policy making in recent years, with decisions made based on what will maximise housing construction. The net result of all of this is a change in Government priorities. The new priority is all about how to enable the construction of the most housing possible, at the lowest cost to Government possible. Each of these feeds into the other. Additional housing construction provides additional stamp duty revenue to the Government. Lower net costs allows more infrastructure to be built resulting in more potential housing. However, it has also meant that transport goals have fallen in priority. In these cases that translates into less connectivity for Sydney and Macquarie Universities as well as Macquarie Business Park. Chalk it up as a win to the Planning Department and a loss to Transport for NSW. There are two rail lines in Sydney currently under construction or in the planning phase. The first is the Sydney Metro Northwest, announced in 2010 and set to open in 2019; it consists of 23km of new track between Epping and Cudgegong Rd near Rouse Hill as well as the conversion of the existing 13km Epping to Chatswood Line (opened in 2009) to metro operation. The second is the Sydney Metro City and Southwest, announced in 2014 and set to open in 2024; it consists of 13km of new track between Chatswood and Sydenham as well as the conversion of the existing 17km Bankstown Line between Sydenham and Bankstown to metro operation. Although no firm plans are currently in place for expansion of the rail network beyond 2024, there are a number of rail lines that have been mentioned by state and federal Transport Ministers, Premiers, and Prime Ministers. In chronological order of their first announcement, these include an extension of the Sydney Metro from Cudgegong Rd to Marsden Park, an extension of the South West Rail Link to Badgerys Creek, an extension of the Sydney Metro from Bankstown to Liverpool, and a new fast train from Parramatta to the Sydney CBD and Badgerys Creek. Work on preserving a corridor to extend what was then known as the North West Rail Link, now Sydney Metro Northwest, began before construction on the line had even begun. Two options were considered: a Northern extension to Riverstone and a Western extension to Marsden Park via Schofields. The latter option was chosen with the potential to extend it further to the Mount Druitt area, although the corridor is to be reserved with mode neutrality. In other words, it could be both as an extension of Sydney Metro, but it could also be built as even bus rapid transit/light rail or even heavy rail with double deck trains from the T1 Western Line at Mount Druitt or St Marys. The South West Rail Link would be extended from the current terminus at Leppington through to Badgerys Creek at the new Western Sydney Airport. This line would also include a potential extension North to St Marys and South to Narellan. By connecting to the existing heavy rail network, this line also provides the greatest potential for a freight rail connection to the new airport. However, it does not provide a fast nor a direct rail connection between the airport and Parramatta, the Sydney CBD, nor the existing Kingsford Smith Airport at Mascot. This is also the only proposed new rail line that is an extension of the existing heavy rail network. All of the other 3 proposals involve extensions of the Sydney Metro network currently under construction or the creation of a new single deck fast train. 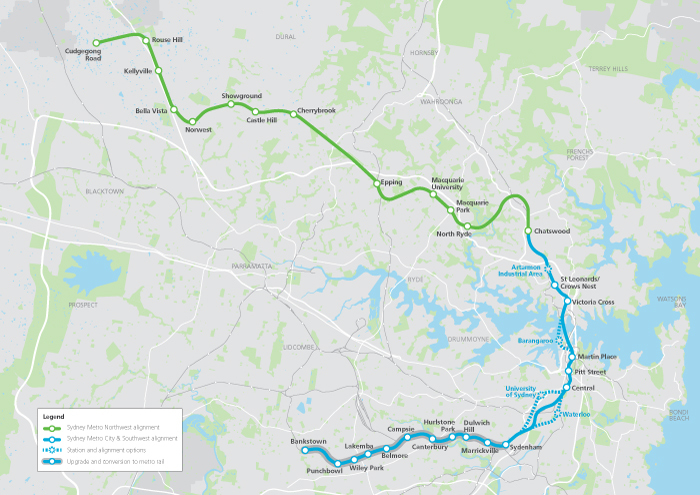 An extension of the Sydney Metro City and Southwest, set to open in 2024 between Chatswood and Bankstown via the Sydney CBD, this would see the line extended further out to Liverpool. Such a line could link both Bankstown and Liverpool to Bankstown Airport, allowing for potential redevelopment of the current airport site into a new business park. It would also provide connections between Liverpool and the Sydney CBD via Bankstown that are set to be lost once the Bankstown Line is converted to Metro services at some point in the next 8 years. Parramatta City Council, in conjunction with the Western Sydney Business Chamber, have proposed a fast train from the Sydney CBD to Parramatta that would complete the journey in as little as 15 minutes. It also includes a Western Link between Parramatta and a future Western Sydney Airport at Badgerys Creek. Upgrading the existing surface rail corridor with stations at Central, Strathfield, and Lidcombe. This would not reduce travel times by more than a few minutes below the current 25 minute minimum. It would also do the least to add extra capacity. A tunnel underneath the existing rail corridor with stations at the future Sydney Metro Station in Pitt St, Croydon, and Lidcombe. This has longer journey times than Options 3 or 4 and has limited scope for value capture. However, it provides the most favourable tunneling conditions. A tunnel South of the Parramatta River with stations at the future Sydney Metro Station in Pitt St, White Bay, and Olypmic Park. This is the shortest and fastest option. It also has the best scope for value capture and most challenging tunneling conditions. A tunnel North of the Parramatta River with stations at the future Sydney Metro Station in Barangaroo, White Bay, and Ryde. This is longer than Option 3, but passes through more existing centres. It has less scope for value capture but better patronage in the medium term. A Southern corridor with an intermediate station in Liverpool. A Northern corridor with an intermediate station in either Blacktown or near the M4/M7. The Western Link has fewer details than the Eastern Link. Proponents are split over which section to build first, with Parramatta City Council CEO Greg Dyer supporting an Eastern Link and Parramatta MP Geoff Lee supporting a Western Link. Meanwhile, Prime Minister Malcolm Turnbull has called for a Western Link to be built earlier than 2046, but not necessarily ready to open simultaneously with a Western Sydney Airport. Sydney Morning Herald City Editor Jacob Saulwick argues that an Eastern Link is more pressing given the capacity constraints between Parramatta and the Sydney CBD, but that it would be a good stage one for when a future extension to Badgerys Creek becomes needed and built as stage two. A station at either McEvoy St or Green Square could form part of the new Sydney Metro railway currently under construction according to NSW Government plans. These plans show a range of potential alignment options considered for the line between Central Station and Sydenham, ranging from a Western alignment through Sydney University and Newtown through to an Eastern alignment through Waterloo and Green Square. The Government recently decided that the line should pass through Waterloo, rejecting the Sydney University option. However, these plans pre-date that decision. Maps of the potential alignments show that a line through Waterloo could go directly to Sydenham, but could also potentially continue South to include an additional station either McEvoy St in Alexandria or Green Square where an existing Airport Line station is located. A station at Green Square could allow for easy transfers between the two lines outside of the congested CBD. These stations have not been mentioned previously by the Government when discussing either the Sydney University or Waterloo options. The Sydney Metro consists of two stages. Stage one comprises the former North West Rail Link from Rouse Hill to Epping together with the Epping to Chatswood Rail Link, which is scheduled to open in 2019. Stage two consists of a new tunnel from Chatswood to Sydenham together with the conversion of the Bankstown Line from Sydenham to Bankstown, which is set to begin construction next year and open in 2024. The line will operate with driverless single deck trains with limited seating on a frequent turn up and go style timetable. The budget for constructing the skytrain portion of the North West Rail Link, an elevated viaduct between Bella Vista and Rouse Hill, has blown out from $340m to $390m. Despite the cost blowout, a project spokesperson said that there has been no change to the completion date for the skytrain, while the Transport Minister Andrew Constance stated that variations in cost had been factored into the full $8.3bn budget and that the overall budget remained unchanged. Sydney’s single deck train network will be known as Sydney Metro, replacing the previous name Sydney Rapid Transit. This follows the passage of legislation authorising the privatisation of state owned electricity assets, which passed both chambers of Parliament the previous day. The new Shadow Transport Minister Ryan Park, who together with the Opposition Leader Luke Foley recently withdrew their support for light rail down George Street, announced that the change of heart on light rail came after reading the 2012 Infrastructure NSW Report that opposed George Street light rail. The alternative bus tunnel option suggested by the report was criticised by Transport for NSW, with Infrastructure NSW later supporting George Street light rail. 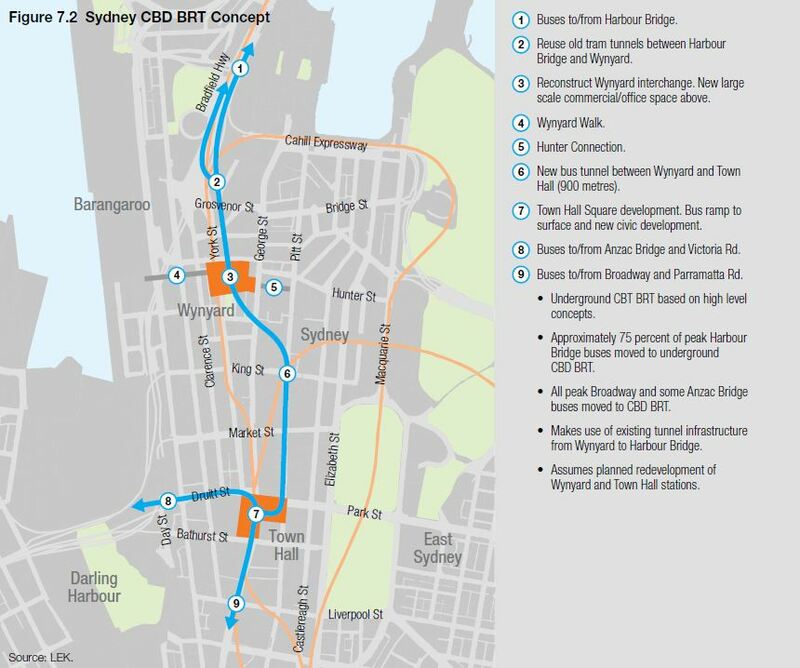 Work to reserve transport corridors in Sydney’s West for an Outer Sydney Orbital motorway, Bells Line of Road to Castlereagh Connection, and South West Rail Link extension is moving into the public consultation phase. The NSW Roads Minister Duncay Gay said that work on the 2 roads was not expected to begin for decades; with the SWRL corridor set to be identified by late 2016. A light rail line connecting Parramatta to Olympic Park has firmed as the favourite option for a new light rail line in Sydney’s West. The line could extend out to Wesmead in the West and Strathfield in the East. It gained favour after a campaign by businesses and developers who touted the possibility for development of the corridor and the potential for value capture from that development to fund the cost of building the new line. However, local councils have labelled the line a white elephant and are calling for the Government to build a line to Epping instead. New Opal only gates have been installed as part of the Wynyard Station upgrade. Opal only gates have recently been installed at Olympic Park Station. No date has been set for the full phase out of ticket gates that accept magnetic stripe paper ticket. 12 June: SWRL connection to CBD via Granville? Transport blogger Nick Stylianou suggests that Leppington trains may be connected up to the T2 South Line, travelling to the CBD via Granville. This may happen as soon as the end of this year, with Campbelltown to city services running exclusively on the T2 Airport Line. Sydney’s existing 150 transport officers is set to increase to 215, with an additional 65 transport officers to be hired. The Government is set to trial boarding of buses via the back door for 2 weeks. The trial will be restricted to Opal card users between 4PM and 7PM at 7 bus stops in the CBD. Marshals will be present to ensure boarding occurs safely. It is hoped that the trial will see lower dwell times for buses by allowing customers to board more quickly. The NSW Government has announced a watered down version of a minimum parking requirement policy that it announced last year. The new policy allows new apartment blocks in areas well serviced by public transport to have fewer off-street parking spots than is currently mandated by local government regulations. The previously announced policy would have eliminated the requirement for off-street parking entirely and has not been adopted. Supporters of the move argue that it will help to keep construction costs down and help with housing affordability. Opponents of the move claim that it will cause cars to spill over into existing streets where parking is already scarce. A Station at Barangaroo has been confirmed in the Sydney Metro City and Southwest. Stations still to be determined are Artarmon, St Leonards/Crows Nest and either Sydney University or Waterloo. The name Sydney Rapid Transit is no more, with the project to be renamed Sydney Metro. Its two component parts, the North West Rail Link and Second Harbour Rail Crossing are also getting new names; they will now be known as Sydney Metro Northwest and Sydney Metro City & Southwest respectively. The news comes in response to the passage of legislation through the NSW Parliament to allow the partial privatisation of the state’s electricity distribution network via a 99 lease of 49% of the business in order to provide funding for the second stage of the Sydney Metro project. Sydney Metro Northwest is set to open in early 2019 with construction already underway; while Sydney Metro City & Southwest is set to open in 2024 with construction starting in 2017. The latter has 4 confirmed stations between Chatswood and Sydenham: Victoria Cross (North Sydney), Martin Place, Pitt Street (Town Hall), and Central. It will also include either an underground station at Crows Nest or an above ground station utilising the existing platforms at St Leonards, depending on where tunnels on the Northern end will emerge. The Sydney Metro website states that “options for where the tunnels start include just south of Chatswood or at St Leonards”, with a final decision yet to be made. Meanwhile, additional stations are also being investigated at the Artarmon Industrial Area, Barangaroo, and either the University of Sydney or Waterloo. It remains unclear whether tunnels on the Southern end will emerge at Sydenham or whether they will emerge further North with the line then travelling along an existing reservation between Erskineville and Sydenham.